BASELAYER will be joining 1,500 other professionals whose day job is keeping the digital world up and running. From “mud to cloud”, this event covers the full ecosystem for the redefinition of enterprise data centers, and spotlights the re-shaping of the economics of digital business, IT, and data center service delivery. The summit features over 100 hours of expert panels, keynote presentations, interactive workshops, and roundtables. The expo will showcase 100 of the latest technologies. Also on May 1, BASELAYER’s Bill Slessman and Christopher Perez will present Imagine It, Build It: A Lego-Inspired Approach to Data Center Design on stage in Hall 2. This session will take a peek at our “Lego” style design concepts, and examine Puget Sound Energy’s leveraging of our mix-and-match approach to solve their recent modular data center build. In addition, we will outline how the multiple power and cooling options can combine to deliver flexible, scalable, and sustainable infrastructure anywhere you need it. And ultimately, we will examine the ways that dynamic visualization enhances modular assets and allows operators new insights into their data center environment. In addition to the summit, DCD’s Focus Day on April 30 will provide an interactive pre-conference concentrating on deploying data centers at the edge and assessing the new technologies and architectures to support this. 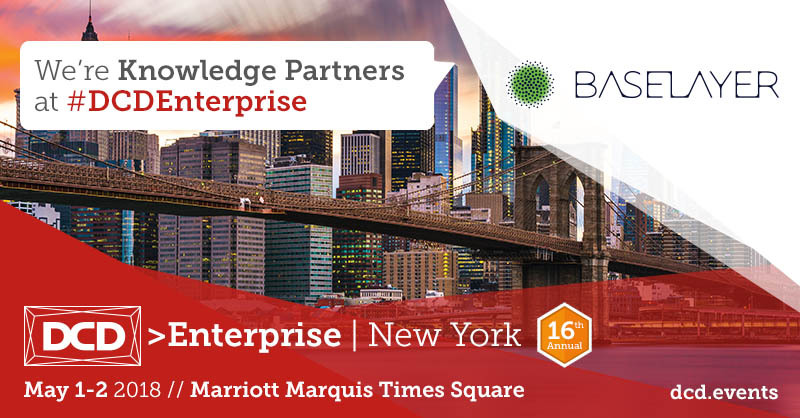 BASELAYER’s Susanna Kass will participate in two panel discussions: The Practicalities of Sustainable Edge Computing in Dense Urban Environments and Data Centers at the Edge in 2025. Since 2008, here at BASELAYER we have been creating innovative technology to transform the data center. We deliver hardware and software products which ensure the data center fulfills the needs of today’s applications and support innovation into the future. We would love to shake your hand at DCD, so come say hello between April 30 and May 2 at the New York Marriott Marquis on Broadway. At BASELAYER, we simplify the data center and make it smart. Learn more about the summit here and more about our products here.